There are times, especially now in holiday season, when you have people coming over for a drink in the evening. Nights where you get off work and have just enought time to swing by the corner store on your way home and then frantically clean your house before people show up. These are the nights that you don’t want to have to cook snacks for your guests, but you realize that if you just give them wine, they will be too wobbly when they leave your house. Last night I had some girlfriends over and not only did not have time to cook cute little appetizers, I didn’t feel like it. I wanted something easy. So I ran by the corner store on my way home and I grabbed the things I needed to make a basic party platter. Maybe this post is too obvious. It isn’t complicated to throw some snacks on a tray for people. But, I thought I would write about it anyways, because when you are without ideas and people are on their way, it is good to have a standard. Not only is this a standard for easy party nights, I usually do a similar cheese/meat platter for all my parties in addition to whatever else I’m making. Because really, who doesn’t like some salami and cheese? So the picture above is what I threw together for my ladies. 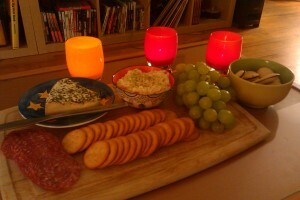 I like to serve on a cutting board and I put a few of the items on/in cute plates and bowls. Presentation is everything. When my boyfriend got home before the ladies showed up and saw the set up he said, “You like your girlfriends better than me!” I replied, “I feed you every day.” Though perhaps it means I could work more on my daily presentation. This covers people’s general snacking needs. Sweet, salty, creamy, and some fruit to cleanse the palette. When in doubt, artfully assembling these items will look like you worked really hard to feed people and it will keep hungry, wine-filled tummies happy. You can make it your own, just be sure to make it easy. Not every hosting event has to be work. I hope this helps next time you have people heading your way and need some snack ideas! Valuable information. Lucky me I discovered your website unintentionally, and I’m surprised why this twist of fate didn’t happened in advance! I bookmarked it. Somebody necessarily lend a hand to make critically articles I’d state. That is the first time I frequented your web page and so far? I surprised with the research you made to make this actual publish extraordinary. Wonderful task! I have learn several excellent stuff here. Certainly worth bookmarking for revisiting. I surprise how so much effort you place to make any such wonderful informative web site. My husband and i felt quite delighted Ervin could round up his preliminary research via the precious recommendations he discovered out of your weblog. It’s not at all simplistic just to continually be giving away tips and hints that most people have been trying to sell. So we do know we’ve got the writer to be grateful to for this. The illustrations you have made, the easy blog menu, the friendships you make it possible to foster – it’s got most impressive, and it’s really leading our son in addition to the family consider that that issue is interesting, which is certainly very pressing. Thanks for everything! Wow, superb blog layout! How lengthy have you ever been running a blog for? you made blogging look easy. The entire glance of your site is magnificent, let alone the content! I would like to thnkx for the efforts you’ve put in writing this blog. I am hoping the same high-grade web site post from you in the upcoming as well. Actually your creative writing abilities has inspired me to get my own web site now. Actually the blogging is spreading its wings rapidly. Your write up is a great example of it. Attractive section of content. I just stumbled upon your website and in accession capital to assert that I acquire actually enjoyed account your blog posts. Anyway I will be subscribing to your feeds and even I achievement you access consistently quickly. It is perfect time to make some plans for the future and it’s time to be happy. I’ve read this post and if I could I want to suggest you few interesting things or suggestions. Maybe you could write next articles referring to this article. I desire to read more things about it! I wanted to send a simple remark to appreciate you for some of the magnificent concepts you are placing at this site. My long internet research has at the end of the day been rewarded with really good facts and strategies to talk about with my companions. I would suppose that many of us website visitors actually are very fortunate to be in a fine website with very many awesome people with good advice. I feel very privileged to have encountered your entire web site and look forward to many more awesome times reading here. Thank you again for all the details. I would like to thank you for the efforts you’ve put in writing this site. I’m hoping the same high-grade web site post from you in the upcoming also. In fact your creative writing skills has inspired me to get my own site now. Actually the blogging is spreading its wings quickly. Your write up is a great example of it. My husband and i felt quite excited when Jordan could do his researching out of the precious recommendations he got in your weblog. It’s not at all simplistic to simply always be giving for free points which often some people may have been selling. We acknowledge we need the blog owner to thank because of that. The specific explanations you made, the straightforward site navigation, the relationships you can assist to foster – it’s got everything amazing, and it’s really facilitating our son and us do think this theme is amusing, and that’s extremely indispensable. Thank you for all the pieces! Definitely, what a great blog and illuminating posts, I surely will bookmark your site.Have an awsome day! Whats Going down i’m new to this, I stumbled upon this I have found It positively helpful and it has helped me out loads. I hope to contribute & assist other customers like its helped me. Great job. A person necessarily help to make significantly posts I’d state. This is the very first time I frequented your website page and thus far? I amazed with the analysis you made to create this particular put up incredible. Wonderful activity! Thanks for the sensible critique. Me & my neighbor were just preparing to do a little research on this. We got a grab a book from our local library but I think I learned more clear from this post. I’m very glad to see such great information being shared freely out there. Somebody necessarily help to make significantly articles I would state. This is the first time I frequented your web page and thus far? I amazed with the analysis you made to make this particular put up amazing. Great task! I just want to tell you that I am just newbie to blogging and honestly savored this web page. More than likely I’m going to bookmark your blog . You certainly come with very good writings. Thanks a lot for revealing your website page. Hello, Neat post. There is an issue along with your site in web explorer, could check this¡K IE still is the market chief and a large component to folks will leave out your fantastic writing because of this problem. Hello there, I found your web site by means of Google at the same time as searching for a related subject, your web site got here up, it seems to be good. I’ve bookmarked it in my google bookmarks. hello!,I like your writing so much! share we keep in touch more approximately your article on AOL? I need an expert in this space to resolve my problem. May be that is you! Looking forward to peer you. I have to point out my affection for your kindness for individuals that should have assistance with that question. Your real dedication to getting the message all over appears to be extremely effective and have regularly permitted associates much like me to attain their targets. The informative instruction signifies much a person like me and much more to my office workers. Many thanks; from all of us. I was just looking for this info for a while. After 6 hours of continuous Googleing, at last I got it in your site. I wonder what’s the lack of Google strategy that do not rank this kind of informative web sites in top of the list. Usually the top sites are full of garbage. My wife and i were contented when John could do his studies out of the ideas he grabbed from your own web page. It’s not at all simplistic just to find yourself giving for free thoughts which usually some people might have been selling. We grasp we have the blog owner to thank because of that. Those explanations you made, the straightforward website navigation, the relationships you can help create – it’s most awesome, and it is aiding our son in addition to our family consider that that theme is enjoyable, which is incredibly important. Thank you for the whole thing!